Rubbers | How can I recycle this? How can I reuse or recycle rubbish pencil erasers? I bought a big bag of rubbers at the start of school but they were hard and rubbish so I turned them into stamps instead! I drew a design on them then cut it out with an art knife and they work great. I remember doing something similar with them when I was at school – although it was less artistic/planned and more just me being bored with an compass in French. Another at-school reuse was, of course, flinging them across the classroom and watching them bounce off the walls/desks. I, of course, never did that, ahem. If you buy a pack of mixed ones, there always seems to be a couple of really hard ones that don’t work very well in there. 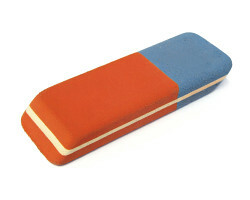 Aside from the stamps and airbourne weaponry, are there any other reuses for erasers that won’t erase?